You’ve shown your work in Singapore a few times. What’s your opinion of the art scene here? If we’re talking about the market, you’ll have to ask the collectors what they think. I like that it’s quite active, it gives people a lot of opportunities to learn about art and experience other cultures through contemporary art. I think that’s especially important for young people to learn about the world. Do you have any recommendations for people who want to go to Chiang Mai? What should they see, eat and do there? Chiang Mai is great for sightseeing; there’s a lot of nature there, and temples. My favourite place there is my studio, I don’t go out much. I’m not a picky eater, I eat everything, so I don’t have a favourite food. Tell us about the book you’re reading. What about the book is interesting? It’s called The Ending of Time, by Jiddu Krishnamurti and Professor David Bohm. The book is a collection of conversations between the two about existence, which is interesting because Bohm is a physicist, while Krishnamurti’s perspective is more spiritual. They talk about conflicts in society coming from the knowledge that we’re bound by time. Time gives us the idea of self, and that creates separations between people. I meditate as a way to practice mindfulness, and I believe that helps me to look past these things. The book’s really inspiring to me because my work comes from my life, and books I read feed into my work as well. Maybe they don’t know anything about me! (laughs) Maybe everything they know is only what I choose to present. I’m an open person; I have nothing to hide. If you want to know something, you can just ask me and I’ll answer. 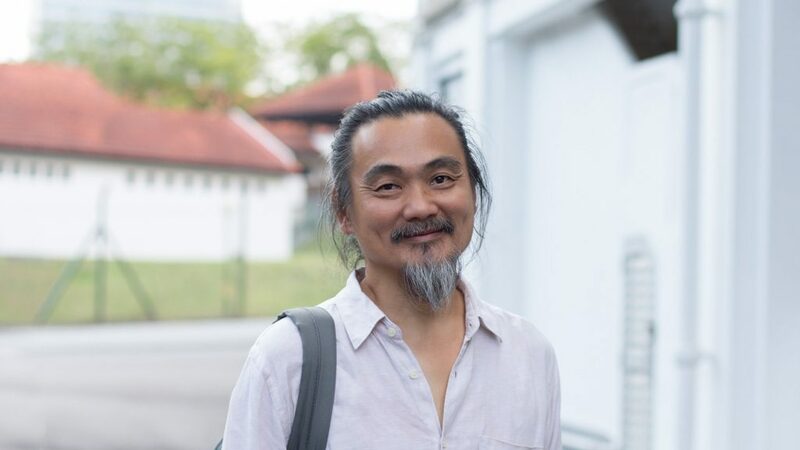 Kamin is one of the artists exhibiting for DISINI at Gillman Barracks.